It is now the time of year to anticipate the preparation of our budget for operations for the next year so that you may have it for consideration before the next annual election of officers. Several items present themselves quite dramatically for your consideration. Annual Dues - It is not possible to anticipate the number of members who will pay dues for a year by merely using the number of members times the annual dues amount. The number of brothers who are not able, or are not interested, seem to change each year. For the coming year (without any input from you), I will use a factor of only 80% of the above equation. This year I used the factor of 95% and was seriously in error. If you disagree, let me know please. Stated Meetings and Reunions - This has always been a moving target but the current economy, it appears to be impossible to make a commitment to make a reservation for our Scottish Rite events. Beginning immediately, we will begin having a split level event cost. On price with a reservation and a higher price for those who attend without a reservation. Adopting this policy may reduce the amount of guessing that the office staff does and still leave flexibility in the ordering of meals and related costs. 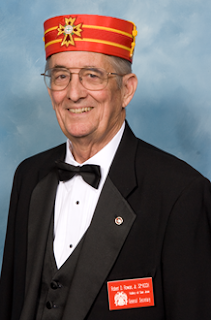 I would request that you call me directly with any input about programs you may want the Scottish Rite to adopt and put into the budget. The Council of Masters would really appreciate any comments from you. We need your support to bring the upcoming Golf Tournament to a successful conclusion. Liberty Mutual Life Insurance has fronted some pretty major costs and wants to have a continuing presence here in San Jose. In order to accomplish all this with our Clinic being the charity of choice, we must make the event successful.